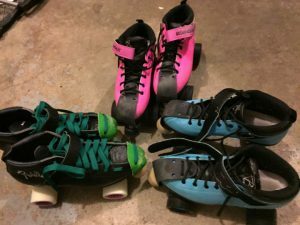 Our favourite things: Trying something new – I’m a Roller Derby mom! arted playing junior Roller Derby in the fall of 2015. It was a great, fun sport for them to get some exercise, and learn new skills. As mom, I stepped in to be the team coordinator, and help offer support to the coaches and other parents in our league. I had it in my head that I was too old, too breakable, and too slow to play derby myself. Then a friend challenged me to try out a “Fresh Meat” program, so that I could learn how to referee the sport. Well, wouldn’t you know, I loved it. I loved the feeling of mastering skills. Of going fast on my skates. Of stepping WAY outside of my comfort zone to try new things. Of learning how to work with others in a brand new way. Of getting sweaty and building muscle outside of the gym. Of laughing really hard, with others, and at myself (maybe mostly at myself, you do need a sense of humour to learn to roller skate!). It is truly liberating to participate in a sport where all sizes can learn, and grow as players. It is empowering to take on a new challenge and actually achieve goals! The stress relief of skating hard is also a huge bonus. One of my daughters even had the chance to bench coach me in a scrimmage game, and that was both humbling for me, and encouraging for her. I can think of no better legacy for my children than to show them that anyone at any age can try new things – even if those things are hard, and don’t come easily. Trying and learning, and being coachable are amazing life skills, and I’m modeling that to them every time I lace up my skates. Even if I fall down occasionally, I still get up and keep going. Have you taken on any new challenges this year? What is holding you back? Try a new sport, or hobby out, and you may be amazed at how much you achieve. Share your new skills in the comments below.